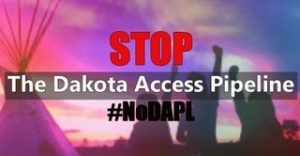 People’s Health Movement Canada salutes the water protectors at the Camp of the Sacred Stone in Sioux territory who have gathered peacefully to prevent the construction of the Dakota Access Pipeline. In response to this action to protect the health of the land and of the people, United States forces have retaliated with violence. The police and National Guard are on the scene to enable the destructive profit-making of private corporations rather than the sanctity of water’s role in environmental and human health. The pipeline was originally planned to tunnel beneath the Missouri River near Bismarck, one of the most populated cities in North Dakota, but when the pipeline’s threat to water supplies was identified, it was rerouted to go underneath the river near the Standing Rock reservation, in a clear example of the environmental racism that is routine in colonial North America. Extractive practices, from pipelines to uranium mines, have scarred the lands of Indigenous peoples across North America. Clean water and a clean environment are necessities of health. The right to come together for collective action is essential for a community’s well-being; and the violence caused by the state can result in trauma that lasts for generations. As we have witnessed in Canada as well, colonial forces protect the profit of greedy corporations, rather than respecting the treaties signed between sovereign nations. We note that at least three of Canada’s biggest banks are involved in financing the Dakota Access Pipeline, namely TD Bank, Royal Bank, and Scotiabank. We call on these corporations to divest from their shameful involvement in perpetuating violence against the health of the Sioux people. As activists who recognise the impact of colonial extraction on health, People’s Health Movement Canada stands with the Standing Rock Sioux in demanding a halt of the construction of the Dakota Access Pipeline. We salute their work. We call on everyone to respond to their requests for support and solidarity, and we challenge Canadians to act on our complicity with this injustice.